Today's Wonderful Website is one that is really neat to me. It doesn't have a lot to do with music at all. It has to do with the other side of what I do. Every day I work in public school classrooms and incorporate assistive technology within my music therapy sessions so that nonverbal or speech delayed students have a way of participating and have a "voice". In the world of assistive technology there are numerous simple and more complex devices for voice output. Today I wanted to share another Wonderful Website that I really enjoy reading. It's one of those websites (blogs) that make me think and help me to analyze what I'm doing and create more ways to achieve the goals for which I'm striving to help students reach. The website is No Limits 2 Learning. Lon Thornburg is the blogger of this site and he is an educator and assistive technology specialist and trainer. His latest post really was of great interest to me in that he writes about observing students learning styles in order to increase the effectiveness of their assistive technology. It's a great post! I'd love to hear from other readers about their assistive technology experiences-with and without music! 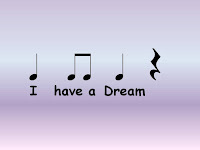 Today I would like to share how I have been using the "I have a Dream" song I shared last week. If you missed it, you can listen to it here. I used this song and incorporated rhythm sticks one day last week, paddle drums the next day, and various rhythm instruments the third day. All attempts were definitely interesting :), but the sticks were definitely the best instrumental accompaniment so far. So, I wanted to share what I did with all my lovely readers. Maybe it will work for you too! Before singing the song, I passed out rhythm sticks and everyone had their sticks quiet on their knees (we don't always reach the quiet part rapidly, but you get the picture). 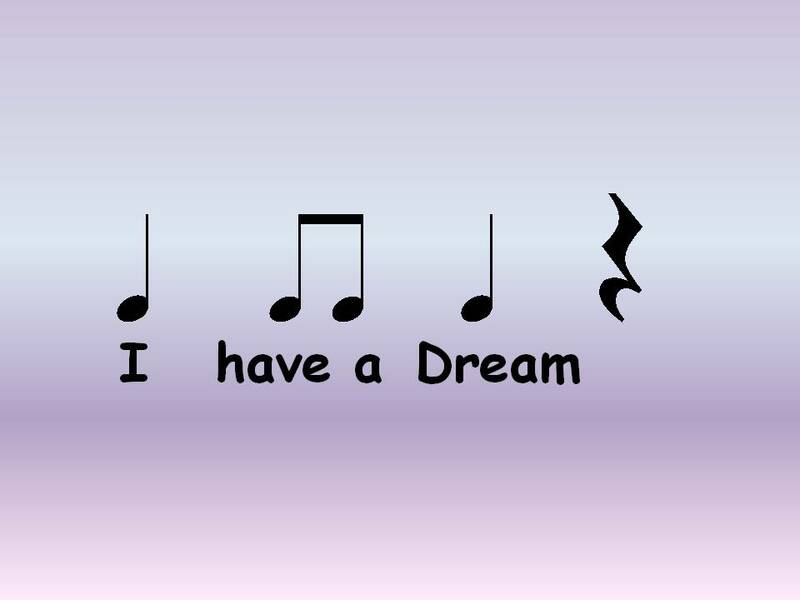 We worked on repeating an ostinato, "I have a Dream, I have a Dream, I have a Dream," etc. The picture below represents the rhythm and ostinato. (For classes where sticks would become the distraction, we clapped this rhythm with our hands first). Once we got that together, we put the rhythm in the sticks. Some students could tap the rhythm independently, and others needed to say the ostinato each time. Once we started the song, the ostinato rhythm fit right in. During the parts of the song where it sings about the color of your hair, skin, clothes you wear,etc. I have the students follow me doing something different with the sticks (i.e. rubbing sticks together, tapping my knees, doing hammer motion with one stick on another,etc.). The music sounds different here, so I figure a different motion is called for. Then when the chorus repeats, I go back to the ostinato. It worked really well, I must say, and the students enjoyed being a part of the song. The first song, A Heart Stands for Love, addresses the shape of a heart and who we give hearts to on Valentine's Day. It also states that a heart stands for love. The second song, Love is a Circle,is meant to be used as a movement song. You can use scarves, streamers, or even paper hearts glued to popsicle sticks to move to this song. The directions mentioned in this song are: around, up and down, hide scarf inside hands and then let out, and around again. As promised, I wanted to share a song about the coldest place I know...Antarctica! 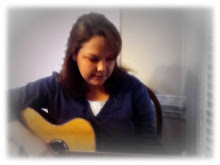 As a music therapist in a public school system, I incorporate music to help the students learn many things. There's social skills, social-emotional skills, fine motor skills, functional skills and of course cognitive and academic skills. Today's post focuses more on the academic skills and helping children learn in social studies. Many of the middle school classrooms I work with studied Antarctica and I put together a song to help them learn the many different things about Antarctica that their teachers wanted to teach them. So, in order to teach about Antarctica, you might as well go ahead and introduce/review the 7 continents. So, today you will get to hear a song about Antarctica, AND a song about the 7 continents too! Both songs were written with a repeating Chorus so that nonverbal students could participate with the use of a voice output device or Big Mac switch. I pre-record the chorus before my sessions so that they will be ready to use. I also designed power points to represent the songs visually. With the 7 continents song, we use our fingers and count out 7 continents each time the chorus is sung. When we sing about the oceans, we make wave movements with our hands and arms. When we sing about the continents being large, we sign for big. Adding movements to the song really does help the students remember the vocabulary and content of the song! In several of the classrooms we taught the sign for "Cold" also, as this is the most important part of learning about Antarctica...it's COLD! So, here it is! The lyrics are below each one so you can follow along. Chorus: Antarctica is a continent. It's the coldest place we know. Antarctica is the coldest, driest, and windiest continent. Ice and snow cover most of the land. There are no trees in Antarctica. No one lives in Antarctica. Some people visit the continent. Well, that's it for today's post. This month we're learning about Australia, so stay tuned for a post about that later this month. Today's post will focus on Math skills, namely counting coin money. There are many steps involved when we expect students to count coin money. First, students must be able to count by 1's, 5's, 10's, and 25's. This is an accomplishment in itself! Second, students must learn to recognize each coin and third, students have to learn and comprehend the value associated with each coin. Today I want to share a song I wrote to help students learn how many quarters are in one dollar. 1, 2, 3, 4 Quarters in a Dollar. 25 cents, then 50 cents. 75 cents, then One Dollar. Here's a visual aide I made for this song via Windows Movie Maker. What songs to you use to help teach counting money? As always, thanks for stopping by! Stay tuned for a post about the coldest place I know! February is Black History month, so today I will share a song that goes along with that theme. I came across a very nice poem about Martin Luther King online, and I quickly put it to music. Hope everyone is having a great week and thanks for stopping by!